In this case the little guys were some outgunned ships that took on the Graf Spee, a beautifully designed and executed pocket battleship that ran amok, for a brief period, among allied shipping in 1939. HMS Exeter was one of the hunters. So too Ajax and Achilles. Achilles was a New Zealand ship and that was part of the appeal of the story. 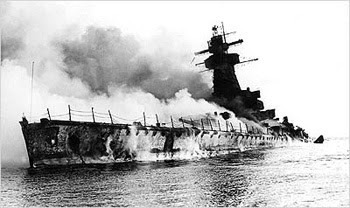 The Captain of the Graf Spee thought he was trapped in the place to which he had run to hide (the River Plate, hence the Battle of the River Plate) and scuttled his vessel rather than run the risk of an embarrassing defeat. Chances are he would have gotten away with a run to the South Atlantic since the forces lined up on him had been bashed up somewhat – Exeter had been withdrawn severely damaged. Every time I drive past the sign pointing to the little town of Exeter I am ten again and listening to that story. And am transported to the mouth of the River Plate. South America was about the most exotic place of which I had ever heard, and hearing “Montevideo” was the time it was first impressed on me that the sound of a word can be sensuous. I practised it for months.